Saint-Denis is a commune in the northern suburbs of Paris, France. Change things up with these side-trips from Saint-Denis: Saint-Philippe (Nature & Wildlife Tours & Jardin des Parfums et des Epices), Sainte-Rose (Notre-Dame des Laves & Anse des Cascades) and Eglise Sainte-Anne de Saint-Benoit (in Saint-Benoit). And it doesn't end there: glide through the air with a parasailing or paragliding tour, see the interesting displays at La Cite du Volcan, make a trip to Maido, and sample the fine beverages at La Saga du Rhum. For other places to visit, ratings, maps, and tourist information, you can read our Saint-Denis sightseeing app . If you are flying in from India, the closest major airport is Roland Garros Airport. In April in Saint-Denis, expect temperatures between 34°C during the day and 26°C at night. Finish your sightseeing early on the 9th (Tue) to allow enough time to travel to Saint-Denis. 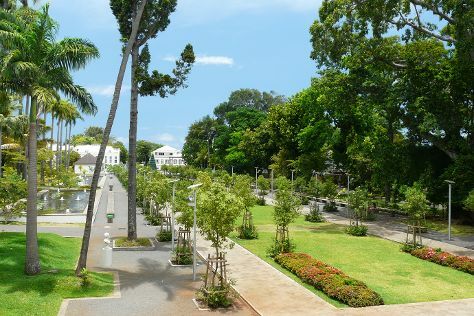 On the 10th (Wed), admire the natural beauty at Jardin de l'Etat, then admire all the interesting features of La Maison du Coco, and then don't miss a visit to Musee Stella Matutina. Get ready for a full day of sightseeing on the 11th (Thu): make a trip to Conservatoire Botanique National, get up close to creatures of the deep with a dolphin and whale watching tour, and then zoom along the surf with a waterskiing or jet-skiing adventure. To see traveler tips, where to stay, and other tourist information, use the Saint-Denis itinerary app . On the 12th (Fri), wrap the sightseeing up by early afternoon so you can travel back home. Jardin Majorelle has been added to your itinerary. Kick off your visit on the 13th (Sat): explore and take pictures at Jemaa el-Fnaa, admire the natural beauty at Jardin Majorelle, and then admire the landmark architecture of Ben Youssef Madrasa. Here are some ideas for day two: admire the striking features of Bahia Palace, relax and rejuvenate at some of the best spas, and then don't miss a visit to Medina of Marrakesh. To see reviews, other places to visit, and other tourist information, go to the Marrakech online trip builder . Use the Route module to find suitable travel options from Saint-Denis to Marrakech. You'll gain 4 hours traveling from Saint-Denis to Marrakech due to the time zone difference. Traveling from Saint-Denis in April, expect Marrakech to be slightly colder, temps between 31°C and 15°C. On the 15th (Mon), wrap the sightseeing up by early afternoon so you can travel back home. Make Merzuoga a stop on your Morocco trip as part of a desert safari. Start off your visit on the 16th (Tue): examine the collection at Macro Fossiles Kasbah, then see the sights as you ascend with a climbing tour, and then take in the exciting artwork at Galerie Laoun. Get ready for a full day of sightseeing on the 17th (Wed): capture your vacation like a pro with an inspiring photography tour and then take in the dramatic natural features at Erg Chebbi Dunes. 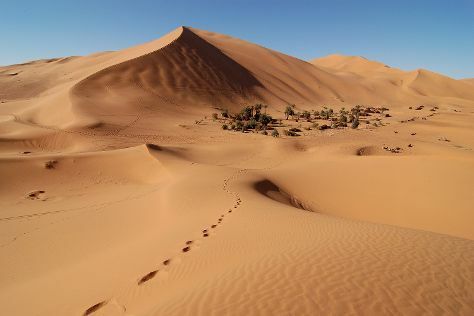 To see where to stay, more things to do, traveler tips, and other tourist information, use the Merzouga trip itinerary maker website . Traveling by combination of flight and taxi from Marrakech to Merzouga takes 6.5 hours. Alternatively, you can do a combination of shuttle, flight, and taxi; or drive. Cap off your sightseeing on the 18th (Thu) early enough to go by car to Casablanca. The port of Casablanca, Morocco's largest city and economic hub, represents the country's beating heart, established as a French protectorate in 1912. On the 18th (Thu), wander the streets of Quartier Habous. On your second day here, take in the spiritual surroundings of Notre Dame de Lourdes, then relax and rejuvenate at some of the best spas, then take a memorable drive along The Corniche, and finally admire the landmark architecture of Hassan II Mosque. For photos, reviews, traveler tips, and more tourist information, refer to the Casablanca trip planner. Getting from Merzouga to Casablanca by car takes about 9.5 hours. Other options: do a combination of bus and train; or take a bus. 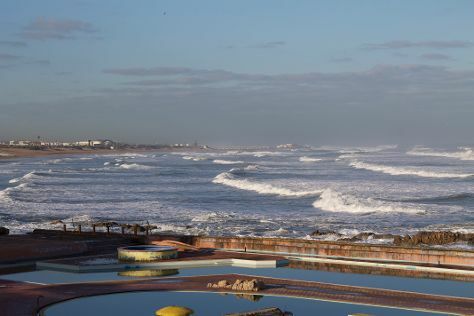 In April, daily temperatures in Casablanca can reach 24°C, while at night they dip to 16°C. You will have some time to spend on the 21st (Sun) before leaving for Fes. Morocco's former capital, Fes enchants visitors with its walled medina, a labyrinthine web of pedestrian-only streets and a World Heritage Site. Kick off your visit on the 21st (Sun): admire the landmark architecture of Bab Boujloud and then relax in sumptuous surroundings at local Arab baths. Get ready for a full day of sightseeing on the next day: don't miss a visit to Moulay Abdellah Quarter, then admire the masterpieces at Nejjarine Museum of Wood Arts and Crafts, then pick up a one of a kind souvenir at La Petite Maison Berbere, and finally admire the landmark architecture of Bou Inania Medersa. To see where to stay, other places to visit, and other tourist information, you can read our Fes trip planner . You can fly from Casablanca to Fes in 3 hours. Other options are to drive; or take a train. Traveling from Casablanca in April, you will find days in Fes are a bit warmer (28°C), and nights are a bit cooler (11°C). Wrap up your sightseeing on the 23rd (Tue) early enough to travel back home.